Portsmouth have confirmed first-team coach Alan McLoughlin has left his role at the club. Manager Andy Awford told the 47-year-old on Thursday that his services at Pompey were no longer required. He was offered a potential new role at the club but turned it down and has left Fratton Park. McLoughlin told BBC Radio Solent he was "bitterly disappointed" by last week's events and had referred the matter to the League Managers Association. 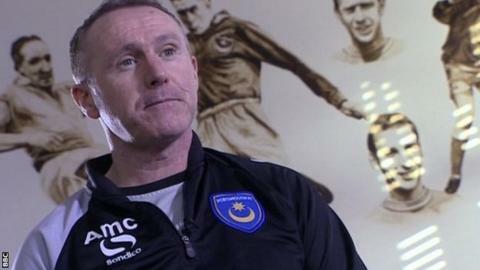 The former midfielder is hugely popular figure with Pompey fans after a seven-year spell as a player in the 1990s. He was made first-team coach in July 2013 by Guy Whittingham and stayed in the role after the sackings of Whittingham and later, Richie Barker. "It has been a hard few days, I had a difficult conversation with Alan last week in which I told him I wanted to change things around," said Awford. "Both the club and I wanted to keep him involved and we have spent the past two or three days exploring a number of possible roles. "In the end all parties have decided it would be best for him if he makes a clean break and I certainly wish Alan all the best, as I have known him for more than 20 years as a friend, team-mate and colleague. He has been a great servant to this club." McLoughlin, who had a kidney removed after being diagnosed with cancer in 2012, spent nearly eight years at Fratton Park as a player, making 361 appearances and scoring 69 goals. "The club would like to thank Alan for his contribution both as a coach and a player," the club said in a statement. "Discussions between the first team manager, club chief executive and board over recent weeks identified the need for more experience at League One and League Two level within the football operation, requiring a re-structure of the backroom staff."